The inaugural Out The Frame Festival is a lesson in female power, Belgian hip hop and Afrofuturistic capabilities. In the city centre of Ghent, in northwest Belgium, stands Vooruit, a historic arts venue and host to the first Out The Frame Festival. Organised by All Eyes On Hip Hop’s Willem Vandesande and Vooruit’s Wouter Vanhaelemeesch, Out The Frame promises to unearth the “most exciting and adventurous hip-hop of the moment”. The lineup is full of underground sounds that teeter on the fringes of mainstream hip hop, ranging from Belgium's incredibly popular Stikstof to Philly's Chynna. Vooruit (which aptly translates as 'forward') is all huge marble staircases, stone benches and neverending vaulted ceilings. Originally a physical hub for Ghent's interwar socialist movement, it housed dances, concerts and markets, and continues to be a hotspot – particularly among Ghent's university students, many of whom are among the young crowd at the festival. Female empowerment is a term tossed around so much these days - everyone from Kim Kardashian to Lena Dunham claims to be empowering women across the world via naked selfies or ‘body-positive’ lingerie campaigns. But 24-year-old rapper Shayna McHale, aka Junglepussy, showed that empowerment does still exist, and it’s much rawer and unabashed than the media might like you to think. She has give-no-fucks lyrics, insane twerking, hair flicking and a domineering stage presence. 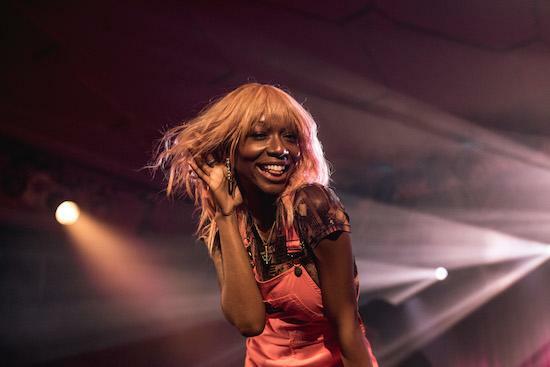 Junglepussy's unapologetically black, confident, self-assured performance transforms the Vooruit ballroom into a heaving, sweating mass of dancing bodies all joining in with favourites ‘Bling Bling’ and ‘State Of The Union’. Her brutally honest lyrics are matched with quips and jibes at the audience as she proclaims, “Everyone wants to be me.” Commenting on the illusory effects of social media, she half snarls, half snickers: “You all think you know me / But you know nothing about the real me.” Junglepussy's refusal to be anything other than herself, both onstage and in her music, is the kind of empowerment we all need. Belgian hip hop is having a moment. Thanks to artists like Coley, Woodie Smalls and the mighty Stikstof, who are leading the revolution, the scene is flourishing. Stikstof drew by far the biggest crowd of the night and received the wildest applause - a mark of their local influence and popularity among young Belgians. Their slick, fast paced rap was married with an energetic performance which included them banging their chests and instigating a hectic moshpit. If their reaction at Out The Frame is anything to go by, Stikstof are about to go huge globally. 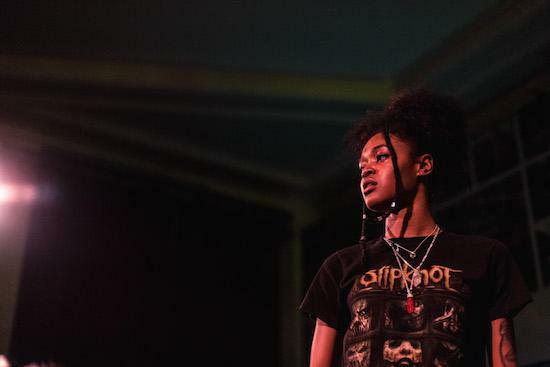 A distinctly London sound, 25-year-old Flohio is part of an emerging new wave of female MCs – think Little Simz, Stefflon Don and Nadia Rose – although comparing her to anyone else goes against her ‘I do what I do’ attitude. The south London MC draws the short straw with an early set time and a small, slightly awkward audience. She has to work hard to get a crowd going and then even harder to get them dancing. Eventually, her unique flow, lyrical prowess and dynamic performance get everyone warmed up – but it’s a shame that she didn’t have the luxury of a later set time. Much like in Woody Allen's Midnight In Paris, everyone interviewed in hip hop documentary Word Is Bond seems to believe that the best has been and gone. Peedi Crack says he “hates rap right now” while Tech N9ne preaches that young MCs today aren’t taught how to rap in style. While of course the hip hop landscape is changed drastically since the halcyon days of the 90s, this kind of outlook surely hinders as opposed to helps progression. Afrofuturism has been propelled into the spotlight recently, thanks to Black Panther, but it’s influence on music hasn’t had anything like the same attention – despite jazz musician Sun Ra pioneering the philosophy. At Out The Frame, Open Mike Eagle’s performance highlights the need for a discussion around the intersection between blackness, music and technology. With lyrics like “Nobody smiles at me cause I’m a black man / Until the show starts” on ‘Smiling (Quirky Race Doc)’ or “Gunned down when it’s sundown” on ‘A Short About A Guy That Dies Every Night’, Open Mike Eagle’s music has obvious political weight. In the same way that Black Panther uses the superhero genre to present an alternative vision of the future, Open Mike Eagle uses comic book graphics to explore a more progressive society. He performs against a backdrop of psychedelic visuals and comic animations which can be seen as a nod to a more colourful future, in line with Afrofuturistic thought. Though Open Mike Eagle’s subject matter is often sombre and poignant, his personality (he also does stand-up) and witty lyrics lift the tone and stop him sounding like someone wallowing in self pity. Gaika closes the festival with an ethereal set that is equally uplifting and sinister. Entering the stage in a black hooded cape and requesting that the lights be turned all the way down, he has the audience submerged in darkness, trapped in his psychedelic spell. His euphoric, cyborg vocals are paired against thumping beats that switch from dancehall to techno to a stripped-back nothing. While the set is dark, though, Gaika himself is a bright and likeable stage presence - someone used to putting on a show and getting his audience riled up. He has repeatedly spoken about refusing to make genre-bound music and this set is a culmination of that commitment. The warped mix of towering vocals, dancehall-infused beats and leftfield hip hop let him create a new space. Gaika takes the festival in a new direction, cradling the last of the festivalgoers, letting us bow out gently.